A sub-zero January morning on Long Island greeted me and my headlamp as I made my way to JFK. I wandered the concourse after dropping off my rental car, found my new traveling companion, New Yorker and Martha’s Vineyard-native Tom Graham, and grabbed a cup of coffee. “What’s in that carry-on?” I asked Tom, a slight, smiling, bespectacled guy with soft eyes and some graying scruff. “Tons of supplies,” he said. Five hours later we landed in Port au Prince, Hait. It was 97 degrees, and I wound up in a dark, caged building negotiating in broken French to get a surfboard bag released for a 30-year-old Californian guy I had just met. This was the beginning of my “cruise” with Nat Benjamin. Turns out when he said he likes to go off the beaten path each winter for vacation, he meant really way off. Benjamin and I have been friends ever since I first directed my editorial abilities toward wooden boats in the early 2000s. 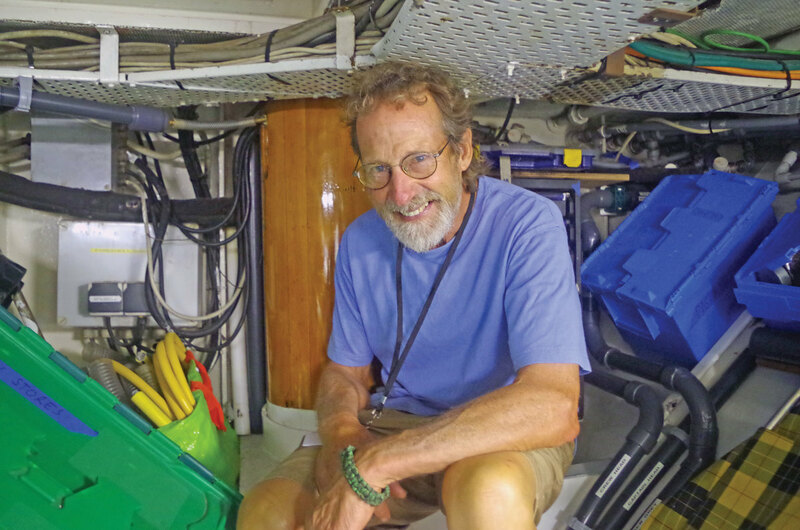 He’s always been a bit of a curiosity, having started Gannon and Benjamin Marine Railway on Martha’s Vineyard in 1980 with Ross Gannon, when wooden boatbuilding and restoration had nearly finished its slow death. I have observed his designs, notably his three statuesque “new” schooners—Juno, Rebecca of Vineyard and his own 50ft Charlotte—shouldering into Atlantic swells since they were launched in Vineyard Haven over the last decade. Since childhood, Benjamin has been a rogue, kick-starting old Fords as a kid and joyriding in Upstate New York while he should have been at school. Education? He was looking for his own form book, his own life school and found his way to boats, eventually running and delivering some run-down woodies in the 1970s. Benjamin met Ross Gannon in Vineyard Haven, helped him with his boat, and the rest is history. Any day that starts with an 0330 alarm going off while sleeping on a friend’s couch is going to be a challenge, even under the best of circumstances. Happy coincidences during this time led to a life-long friendship with John Evans, the legendary publisher of the Village Voice during the 1970s. Their time sailing together, as Evans rode Rupert Murdoch’s media empire wave through the 1980s and 1990s, was a grounding experience for both. 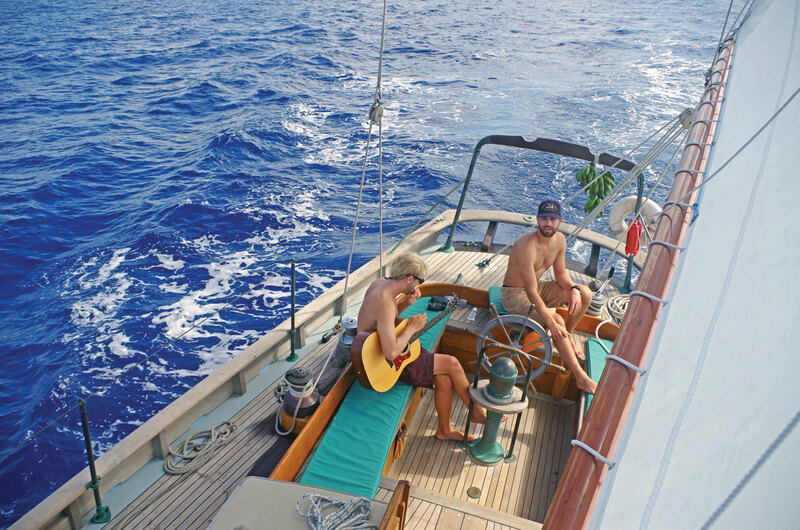 Benjamin’s first design and build commission came from singer-songwriter James Taylor in 1980: the wide-transomed gaffer Sally May, called a Canvas Back sloop by Benjamin. His modest sensibilities endeared him to the music genius, and the two have been sailing companions ever since. Every winter for 30 years Benjamin has brought boats to the Caribbean to ply the charter trades while gale-force westerlies pound his frozen Mugwump barn on the Vineyard. It was always a way to have his designs be seen, earn a bit of scratch and clear his mind on the ocean deliveries. Fitting to his personality, Benjamin wanted to do something different in 2014. Benjamin then proceeded to explain the first half of the mission. Back in 2011 he had traveled to the north shore of Haiti and the Dominican Republic at a time when the devastation of the 2010 earthquake was still fresh and a presidential election was shaking up the populace. While there he visited with locals, shared extra supplies and helped where he could from the platform of the then newly-launched Charlotte. Now Benjamin wanted to go back and take a humanitarian trip, of sorts. The boutiques of St. Barth and the tiki bars of the BVIs gave him a bad taste. Benjamin has never seen much reward in that culture. I knew no different than what’s described above, so when he asked me to gather supplies to bring to a tiny little island off the southwest tip of Haiti for an orphanage I hesitated. “Is this your idea of a vacation?” I asked. “Yeah,” was his simple reply. 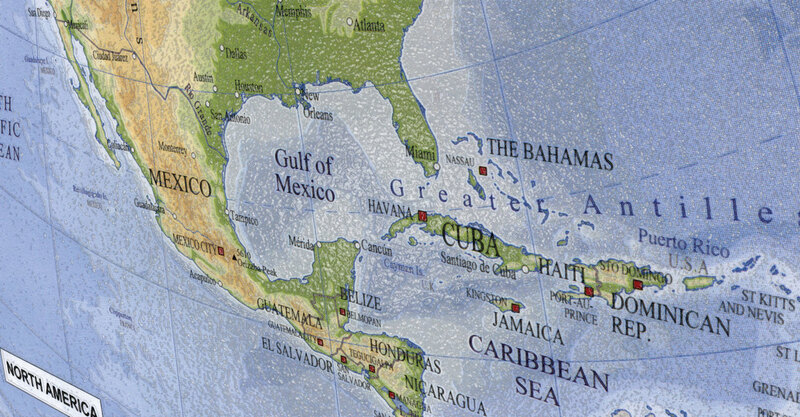 Isle a Vache, or any part of the geopolitically touchy West Indies, is largely unknown to the cruising set, but Benjamin wanted to use its as a staging area for an adventurous hop to Cuba to test Obama’s new regulations. (He had already snuck into Havana once before, via Toronto, with his wife in 2001, when tourism was at a low.) 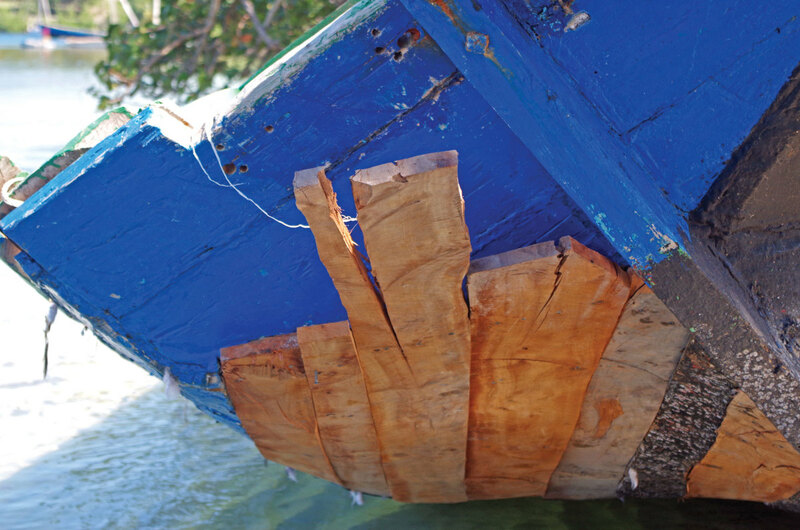 The Haitian island four miles off the coast of Le Cayes had no roads, no electricity and no running water. But it did have a small restaurant, a fledgling hotel or two, a community center and an orphanage. Benjamin had decided to load up Charlotte and head south along with 30-year-old schooner captain Ian Ridgeway as crew. Ridgeway had also served as captain of the tall ship Alabama and would take care of the boat when Benjamin left in Cuba—assuming we made it there. In true islander style, the Vineyard community donated a cornucopia for the people of Isle a Vache and filled the schooner to the deck beams with clothes, books, used sails, art supplies and food and Benjamin set sail in the snow, the day after Thanksgiving. The streets were choked with trash, and a garbage burn pile the size of a city block smoldered. As the broken city shacks faded to country, women scrubbed clothes on stones in the roadside gully. Fortunately, our leap of faith got us to the seaside city of Les Cayes where, thankfully, a 17ft open skiff was waiting for us. At dusk, as the dugout sailing fishing boats hauled their last catches, we pulled up alongside Charlotte. I hugged Benjamin in relief. Charlotte is as her creator had dreamed: a traditional platform for communal living and traveling in an age-old maritime sense. She’s made of Angelique, teak and other hardwoods sourced sporadically by Benjamin who had to build the ship on his own time, between customer orders. Benjamin and his partner Gannon espouse the virtues of traditional simplicity. There are few winches on Charlotte, and most of the exterior woodwork, save the small cabinsides, is left raw, to gray with the sun’s rays in a workboat style. There are no doors below, and though there are nods to the great American designers, Burgess, Stephens and Rhodes, in her lines, Charlotte can easily evoke thoughts of tall ships and Grand Banks fishing schooners with their working crews. At Isle a Vache, Charlotte shared the harbor with a small handful of cruising craft as indigenous workboats, engineless subsistence fishing craft, lined the beach. Later, we filled the community center with supplies. Local scenes of fishing camps were depicted in bright, primary oil colors on stretched canvas. 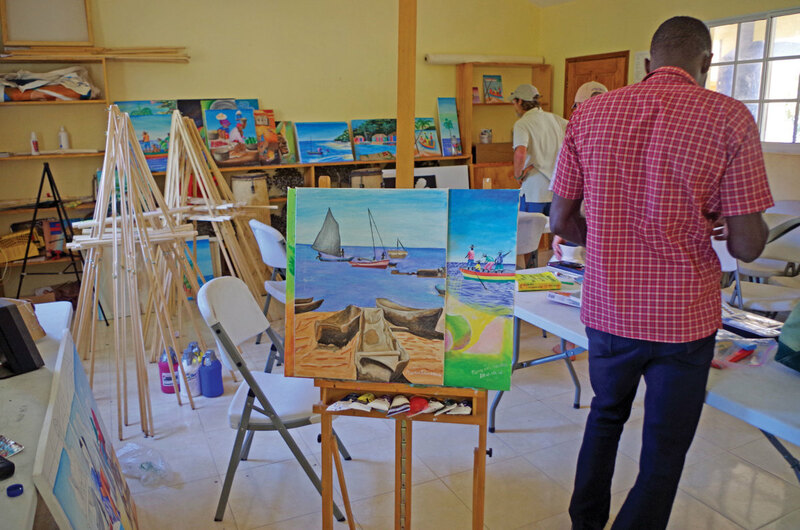 Benjamin’s wife, Pam, and a friend had taught art classes there and at Sister Flora’s Orphanage across the island before departing that week. This conversation alone, sweeping in on the concept that money is not the benchmark of prosperity, made me happy. I was learning something, instead of lying on the beach with a Pusser’s Painkiller in my hand. After that came a trip across the island to see Sister Flora. Nearly 40 years ago, a young French-Canadian missionary found herself in Les Cayes visiting a church and hospital. A baby boy was dropped there and the priest handed him off to her. “The father said, ‘I can’t stay with you,’” I learned later from this matriarch. Inspired, she dreamed up an orphanage to care for this child and the abundance of other abandoned little souls from the mainland. She took them to Isle a Vache and started her work there. A 30-minute moped ride with a strange man brought me to the orphanage. The fires that smoldered during the day had fresh wood for the night. The occasional goat, one giving birth in the open with its owner by its side, and a small gathering of people were all I saw. Everyone stopped and stared at the pale-skinned guy with the red backpack holding onto a stranger for dear life as we whizzed by. Sister Flora’s tight bun and thick glasses gave me the same chill you get when you are sent to the principal’s office. But her shy smile when I reached out my hand ended that nightmare. In her 70s, Sister Flora shuffled me around as several relaxed, tall European women volunteers moved with the children. One toddler lay on the floor, writhing and drooling. Another child, a teenager wearing tight black curls on her head, with a periodic loud bark and thrusting movements, hung onto a fence behind me. Others were more orderly and running along to get washed up for bed. Huguette Calix was one of the orphans Sister Flora has put through school. A college graduate, the bright young lady returned to the island to run the orphanage. Through this translator, Sister Flora told me that her first orphan, the one left practically at her feet many years ago, had also returned to adopt one of the children. 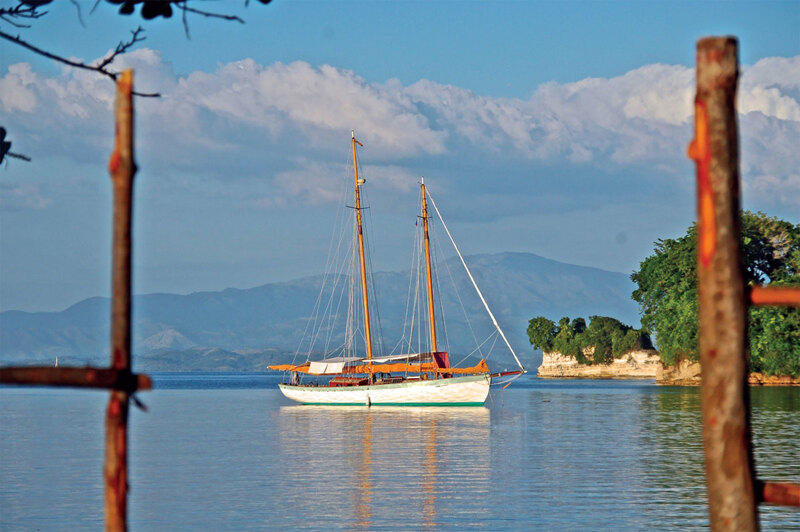 Port Antonio, Jamaica, lay between Sister Flora’s island and Cienfuegos, Cuba. My journalist license to enter and work in Cuba “officially” was hung up in Washington DC, and a refueling and provisioning stop was needed. The thumping of reggae music from the taxis zipping along the waterfront started at 0700 every morning in Jamaica and rose in volume until well after sunset. Clearly this was not the resort town of Montego Bay. Benjamin and Graham studied the architecture and analyzed the columns and tin roofs of eclectic homes on their long walks. But none of us could standing spend a day longer there than necessary, and with my argument on a borrowed cell phone regarding my license still gnawing away at me, we left. We docked in the Marina Jagua in the corner of Cienfuegos’s massive marine lake. There was one other American-flagged ship there, with a couple hosting a student. Because the Ebola epidemic was still in full swing, our temperatures were taken, papers were filled out, some in triplicate, and five hours and two sets of cash fees later, we were given little pink visas and were free to go. 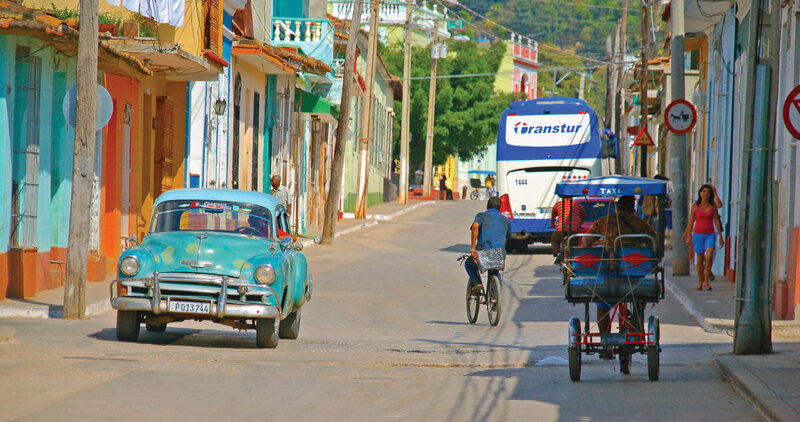 News of the January 16 announcement hadn’t reached the people of Cienfuegos yet. Obama’s move in December had given this country’s citizens hope they could see their friends and family only 90 miles to the north. But they still couldn’t leave the island. Cruise ships dropped hundreds of European and American tourists into the town square with its statue of Jose Marti’, the “Apostle of Cuban independence.” These were allowed as “cultural exchanges” for the Americans. Seeing the tour groups made life feel more like a traditional vacation. But Benjamin went to the corners the tourists missed. Before leaving for Havana by cab, our tour of the French and Spanish-influenced Parque Jose Marti’ led us to a striking gallery. An open art studio displayed bright red and yellow works with the occasional jagged Cuban flag across the subject’s mouth. Benjamin engaged the artist. The two had yet to hear about the new U.S. travel regulations. When Nat told them, they shook their heads in disbelief, smiling. After a three-hour cab ride across the country, we were dropped off in Old Havana at the top of Obispo, the popular merchant street. The street was packed like Times Square. Live Salsa music poured onto the streets, and the “cha, cha, cha,” shake of maracas being sold by the vendors connected seamlessly for a mile. Still nervous about leaving Cuba and re-entering the United States without any challenges, Benjamin broke my anxiety. “I think I’ll bring the family here in the spring before we take Charlotte home,” he said. “This is what Pam and I like to do, expose the kids and grandkids. 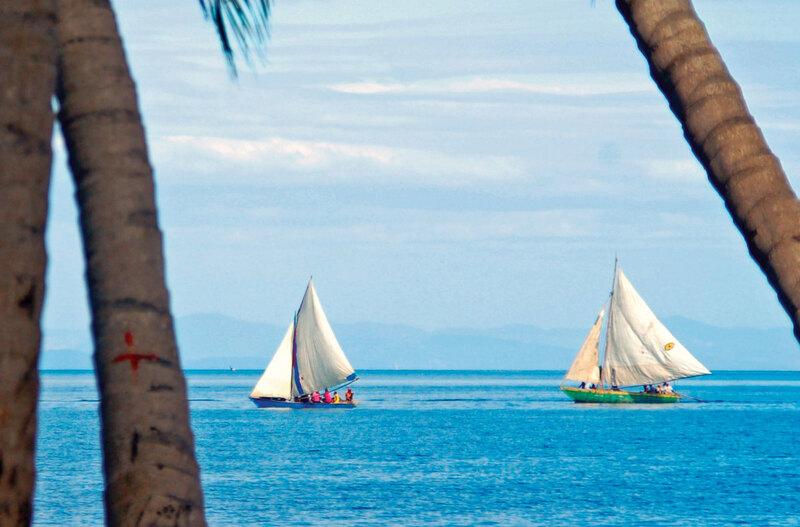 It’s so much more meaningful.” He added he will do as he did in Haiti in 2011 when discarded sails, rigging and tools were handed to fishermen in Labadi. Pam will bring bags of art supplies. I learned, after two bank trips, that despite the January 16 announcement, my American credit card was useless. I was out of money. The remaining bills of Canadian and American dollars Benjamin and Graham had protected barely paid for our bed and breakfast and the cab ride to the airport. Out of money and a day early at the airport, Benjamin took pity on me. I pushed my way into an upstairs room where fretting ticket holders were being interrogated. Miraculously, in a country where English has not been heard for 50 years, Benjamin’s $200 spoke, changed my flight and we were off to Nassau. 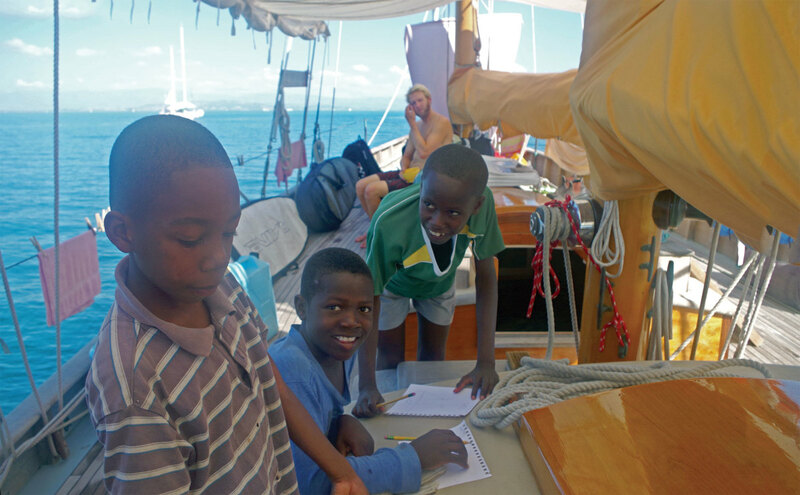 In Nassau, Benjamin told me a story of how he and Pam had been stuck in the Caribbean with no cash, and she needed to get home after several weeks of sailing. The couple in front of them turned and volunteered to help with the flight. It was William F. Buckley, Jr., the famed conservative who was prolific in writings about his sailing escapades. Helping out a shaggy sailor and his wife was good karma for Buckley and for Benjamin as the two traded jokes. More than 30 years later, Benjamin’s unusual sailing habits had put him on the other side of that image, if just. “I told you how much to bring,” he said shaking his head at me in a fatherly manner. “I’m sorry, Nat,” I said. “I was overwhelmed. Thanks for your help. Can I buy you lunch?” “Sure,” he said with a smile. And we went back to doing what he does best, chatting about the incredible places and people we have met in just 12 days of living and traveling aboard his little schooner, Charlotte.